Mónica García’s Election Day Tweets. She won outright Tuesday and avoids the May runoff. LA Unified school board President Steve Zimmer will face Nick Melvoin in the runoff in May, while incumbent Mónica García easily won re-election outright on Tuesday. In the race for the open seat in the San Fernando Valley, Kelly Gonez leads Imelda Padilla going into the runoff. The District 4 contest will continue to be the most closely watched race heading into the May 16 runoff. Zimmer faced a tough re-election challenge but came close to avoiding the runoff, garnering 28,186 votes, or 47 percent of the vote, as of early Wednesday, with 100 percent of precincts reporting. Melvoin got 18,532 votes, or 31 percent. Allison Holdorff Polhill got 8,581 votes, or 14 percent, followed by Gregory Martayan with 4,056 votes, or 7 percent. In District 2, which encompasses downtown Los Angeles and Boyle Heights, García got 13,170 votes, or 58 percent, with all precincts reporting. Challenger Lisa Alva got 7,410 votes, or 32 percent, and Carl Petersen got 2,236 votes, nearly 10 percent. In the wide-open race with no incumbent for the east San Fernando Valley seat in District 6, Gonez led the field, receiving 10,092 votes, or 36 percent, with all precincts reporting. She will face Imelda Padilla in the runoff, who got 8,672 votes, or 31 percent. Patty López got 3,599 votes, or 13 percent, Araz Parshegian got 2,546 votes, or 9 percent, Gwendolyn Posey got 1,601 votes, or 6 percent, and Jose Sandoval got 1,425 votes, or 5 percent. At 7 p.m., an hour before polls closed, LA County Registrar-Recorder/County Clerk Dean Logan said on Twitter that a random sample showed voter turnout countywide was 11.45 percent. Candidates and their backers have poured $6.4 million into races for three seats, with most of that — about $5.4 million — coming from labor groups and deep-pocketed charter school supporters who oppose union influence in education. Charter school supporters and education reformers saw this election as an opportunity to swing the makeup of the board toward a pro-reform majority. García is the longest-serving board member. She joined the board after winning a special election in 2006 for the seat vacated by her then-boss former board member Jose Huizar when he won a seat on the City Council. Four years ago, she faced four challengers and won her seat outright in the primary. García’s party was at PUENTE Learning Center in Boyle Heights with supporters, including the mariachi band from Mendez High School, which was performing as guests were watching results come in. “I’m feeling good,” she said after the early results posted. She praised her campaign staff, including her campaign manager who is a Fremont High School graduate. The only endorsement from her school board colleagues came from Ref Rodriguez, who represents District 5. Both García and Rodriguez are viewed as charter allies. García had a commanding fundraising lead heading into the primary. She raised $217,140 and spent $212,013. Outside groups, including the California Charter Schools Association Advocates, New York-based Students for Education Reform Action Network and Service Employees Union International Local 99, spent $346,115 to support her candidacy. Her challengers did not receive any support from outside groups. Alva is an English teacher at Bravo Medical Magnet High School and has worked for the district for about 17 years. She received high-profile endorsements from the Los Angeles Times and the union representing LA Unified administrators but did not receive an endorsement nor any financial support from United Teachers Los Angeles, of which she is a member. She raised $13,212. “It’s embarrassing that UTLA did not step up to the plate on my behalf,” Alva said Tuesday night. She said she met with UTLA representatives months ago who said they wouldn’t endorse in her race because they would be focused on Zimmer’s race. She said it made for uncomfortable situations when UTLA representatives would be at events to support Zimmer and Padilla, but not her. A first-time candidate, Alva said she learned a lot about campaigning. She said if she could do it over again, she would have started earlier, done more research, and requested meetings with groups she should speak to. The District 4 contest is the most closely watched race on the ballot. Most of the money and mudslinging during the campaign landed here. More than half-dozen candidate forums were held for the candidates. Zimmer is running for his third and final term. In 2013, Zimmer avoided a runoff by receiving 2,653 votes more than his challenger. Former LA Mayor Richard Riordan gave $1 million to an independent expenditure committee that opposed Zimmer’s candidacy. 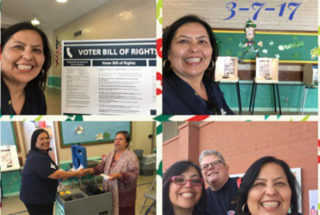 UTLA spent more than $1 million to support Zimmer’s candidacy. In total, IEs including Riordan’s and the CCSA Advocates spent nearly $1.6 million to oppose him. IEs funded by labor groups spent about $1.2 million to support him. “What we see tonight without any shadow of a doubt is that the voters of the 4th District rejected the politics of hate and the voters of the 4th District embraced a much more hopeful narrative about our public schools and in embracing the hopeful narrative, very significantly rejected the narrative of failure,” Zimmer said Tuesday night. Zimmer said he didn’t believe the tone of the campaign would improve in the runoff. Melvoin, a teacher, lawyer, and reform advocate, entered the race more than a year ago. He raised nearly $425,000 the most of any school board candidate ahead of a primary since 2007. He had high profile endorsements from the Los Angeles Times, CCSA, former LA mayors Antonio Villaraigosa and Riordan. IEs spent $556,572 to support him and UTLA’s IE spent $177,612 to oppose him. “I think that despite what was a negative campaign from outside groups, our message was about bringing people together and trying to improve all schools. I think that resonated with folks,” Melvoin said. He said he hopes the campaign in the runoff will “cut through the charter versus union gloss,” so he and Zimmer will be able to discuss issues like the budget deficit, collaboration, and teaching. He also hopes to pick up the votes that went to Polhill and Martayan in the primary. Holdorff Polhill, a former board member of Palisades Charter High School and parent, also received an endorsement from CCSA. She raised about $111,000 ahead of the primary. IEs spent $259,012 to support her candidacy and UTLA spent $126,029 to oppose her. Martayan, who owns a public relations firm and is a Los Angeles Police Department reserve specialist, was a dark horse in the race. He did not have any money from outside groups supporting or opposing him. He raised $71,475 from Southern California donors. During the campaign, he repeatedly railed against special interest groups who he claimed were attempting to buy the election. Incumbent District 6 board member Mónica Ratliff did not run for re-election, instead choosing to run for the District 7 City Council seat. Six candidates were on the ballot to succeed her. Gonez, a seventh-grade science teacher at Crown Preparatory Academy, a STEM-focused charter school in South LA. She was an education policy adviser for the Obama Administration. She raised the most money in her race ahead of the primary nearly – about $125,000. She was endorsed by the CCSA and former LA mayors Antonio Villaraigosa and Richard Riordan Two outside groups associated with the California Charter Schools Association Advocates spent $614,000 to support her candidacy. She ran as the only teacher in her race. “I feel encouraged and optimistic about the early results, but I know there’s a long way to go,” Gonez said Tuesday night. “We feel like we left it all out on the field, and we were working really hard until the last minutes,” she said. A first-time candidate for office, she said it was difficult for her to fundraise, especially while teaching. “I don’t think it was easy-going, but I definitely recognize that those resources were critical to getting out our message,” she said. She ran her campaign from the beginning as if she wouldn’t get outside support, she said. “I wish that we lived in a system where outside spending wasn’t the norm,” she said. “I think it would ultimately be better for the integrity of our elections, but I’m grateful that I have people behind me. “Do I agree with everything? No, but I’m grateful to have their support,” Gonez added. Padilla is a community activist who works for a grant writing firm called California Consulting. She received endorsements from UTLA, SEIU 99 and the Los Angeles Democratic Party. She raised about $80,000. Independent expenditure committees, including those funded by UTLA and SEIU 99, spent $413,755 to support her candidacy and the CCSA Advocates IE spent $125,762 to oppose her candidacy. She said she is going to keep holding community fundraisers, visiting schools and reaching out to the community if she makes it to the runoff. Parseghian is a loan officer and board member of the LA Valley College Foundation. He raised about $43,000. No IEs supported or opposed his candidacy. López, a former state assemblywoman, did not raise more than $1,000 for her run. The CCSA Advocates spent nearly $90,000 to oppose her candidacy. López was defeated in November as she was running for re-election in Assembly District 39 to her second term. She was defeated by Raul Bocanegra, who she had ousted from the seat in 2014. “I’m a little disappointed how money can mislead people especially when the person who is leading this race has never been in my district never done anything for my community,” López said. She said she believes Padilla and Gonez do not have enough experience and said she would remain active in the school district to represent her community. Posey, an event planner and community activist, and Sandoval, an animal rights educator, were also on the ballot in District 6. *This article has been updated with results as 100 percent of precincts are reported and with election night comments from the candidates.